4 panel 1 CD Digipak. Tray on right. 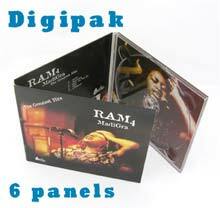 5.47" X 0.25" X 4.94"
4 panel 1 CD Digipak with tube pocket. Tray on right. 5.47" X 0.25" X 4.94"
4 panel 1 CD Digipak with slit pocket. Tray on right. 5.47" X 0.25" X 4.94"
6 panel 1 CD Digipak . Tray in middle. 5.49" X 0.31" X 4.94"
6 panel 1 CD Digipak . Tray on right side. 5.49" X 0.31" X 4.94"
8 panel 2 CD Digipak . 8 panel 3 CD Digipak . 6 panel 2 CD Digipak. Trays on center and right panels. 5.531" X .5" X 4.9375"
8 panel 4 CD Digipak. 5.5625" X .875" X 4.9375"
6 panel 1 CD Digipak with corporate pocket. Tray on right side with pocket in the center. 5.531" X .343" X 4.9375"
6 panel 2 CD Digipak with corporate pocket. Trays are to the right and in the center and the pocket is to the left. 5.531" X .5" X 4.9375"
4 panel 1 CD Digipak with corporate pocket. Tray is on the right and the pocket is on the left. 5.531" X .3437" X 4.9375"
8 panel 1 CD Digipak. Tray is to the far right. 5.593" X .312" X 4.9375"
4 Panel 2-CD Digipak. Both inside panels have trays. 5.531" X .4375" X 4.9375"
4 panel 2 CD oversized Digipak. This model is oversized allowing both trays to be on the same panel, to the left when opened. 5.625" X .3125" X 10"
4 panel 2 CD oversized Digipak. This model is oversized allowing both trays to be on the same panel, to the right when opened. 5.625" X .3125" X 10"
8 panel 1 CD Digipak. Tray is on the right-to-center panel. 5.547" X .4375" X 4.9375"
4 panel 1 CD Digipak with tube pocket. Tray is to the right and the tube pocket is to the left. 5.5" X .28" X 4.94"
4 panel 1 CD Digipak with tube pocket. Tray is to the right and the tube pocket is to the left. 5.562" X .25" X 4.9375"
4 panel 1 CD Digipak with slit for booklet. Tray is on the right and the book slit on the left. 5.59" X .25" X 4.93"
4 panel 1 CD Digipak with slit for booklet. Tray is on the right and the book slit on the left. 5.492" X .276" X 4.941"
8 panel 1 CD Digipak. Tray can be place on either panel right of the center spine. There is also no spine between the front cover and the far left panel. 5.469" X .344" X 4.953"
6 panel 1 CD Digipak with tube pocket. Tray is on the right and the pocket is in the center. The pocket has a half circle thumb hole on its left side. 5.594" X .3125" X 4.8375"
This digipack folds differently than Design 15004. Tray is on the right and the left panel folds flat against the center (no spine) making the center panel the front cover. 5.5" X .297" X 4.9375"
6 panel 1 CD Digipak. This model is European size. Tray is in the center. 5.469" X .312" X 4.9375"
6 panel 1 CD Digipak slipcase.